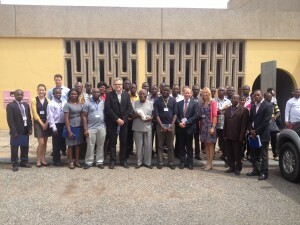 Last week, TAHMO launched its pilot project in Accra, Ghana. The two-year pilot will set up a water and weather monitoring system in Ghana’s cocoa region, funded by The Netherlands Organisation for Scientific Research (NWO). The Kick-off event was chaired by Mr. Nii Boi Ayibotele, the CEO of NII Consult, Chair of the Global Water Partnership of Ghana and a consultant to the Water Resources Commission of Ghana. Together with Farmerline and Kwame Nkrumah University of Science and Technology (Kumasi, Ghana), TAHMO will establish 40 new automated weather stations in High Schools across Ghana. Within this consortium Farmerline, a private company based in Ghana, will use the weather data to provide improved information access for small-scale farmers. Farmerline reaches local farmers through their mobile messaging platform, delivering spoken messages in local languages. The pilot is connected to the programme “Climate Change Education in Schools”, organised by the Environmental Protection Agency (EPA), in which students are educated on climate change. The program aims to reach the wider community by motivating students to share their climate education with their parents, peers, friends and other relatives. The weather stations will help in monitoring local weather, and thereby providing a better understanding of ongoing changes in the climate. During the kick off workshop in Accra all stakeholders attended various presentations and meetings. With the ground breaking ceremony the project was officially kicked off. People in arid and semi-arid regions are very vulnerable to #climate shocks and changes. @TAHMO_World is an initiative that develop a vast network of weather stations across Africa while GLOBE seeks to provide students with an opportunity to participate in monitoring the environment through the scientific process of data collection and analysis.